Snap Happy by Chris Betcher is licensed under a Creative Commons Attribution-ShareAlike 4.0 International License. Instead of doing a 365 challenge, I’m documenting the whole school year. So I’ll take my first photo on day 1 at school and upload one image per day each day through 2011. This will be great for us as we are moving into a new building mid year and should be a great document about a big year for us. That’s a great idea Sunny. I had a similar idea to get my own staff doing a similar thing. I really would like to get them into the habit of documenting and reflecting on what they do on an ongoing basis, whether that’s by blogging or taking photos each day. I just happened to start mine on January 1, but you can start these things anytime of course, and it doesn’t have to be every single day… the idea of just sticking to school terms is a good idea. I also thought about creating an open blog that anyone could contribute to (I think Posterous can allow this) so that all the kids could contribute images as well. That would be interesting I think. Another idea was to create a blog for use on a single day, where each post is from a different person… something like “a day in the life of the school” where it gets filled with content (in a single day) from hundreds of contributors who all either write, record audio of take photos or videos, to give a snapshot into their experiences at school that day. So many ideas! I’ll let you know what I end up doing. Thanks for taking the time to experiment with and document these camera tools Chris. I am participating in the #365challenge too, both with my regular camera and an iPhone, so it is good to know about the tools that are available. I have been following your holiday snaps with interest on Twitter and especially like the 360panorama, for giving a great wide view of some wonderful scenery. Keep up the great work you do. 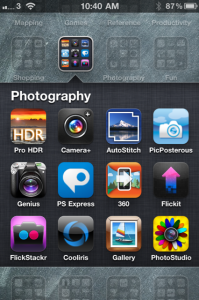 Thanks I really enjoyed reading about the photo apps that you discussed. Some I was aware of and some are new and bout to be downloaded to try out. One that I was told about by a staff member in my local camera store was Hipstamatic – http://bit.ly/g03q3l – a very cool app that recreates a classic eighties – http://bit.ly/idaq3g – 110 format camera. You can experiment with different hipstamatic lenses and film for some great results – I have used it for a few photos in my own 365 photo blog. This is a great review of some of the apps. I love Hipstamatic and all it can do. It is a lot of fun. I have also used Pano to create some cool panoramic and 360 degree photos. I have recently downloaded Photogene which IMHO tops the others for having more of what I want in one app. My favourite photo app at the moment is Hipstamatic. This app allows you to choose from a vareity of retro lenses, flashes and film to create some unique photos. Second is SwankoLab where you get to edit photos in a digital darkroom using chemicals to create some interesting effects. I’m looking forward to getting an iPhone 4 (rather than my 3GS) to be able to take better photos on the fly. Previous PostPrevious Explore. Get Motivated. Learn.